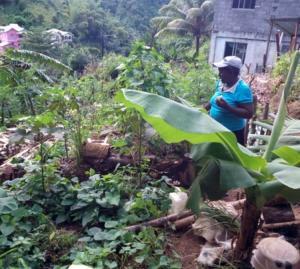 The model garden project seeks to offer Vincentians an alternative to the chemically based methods currently encouraged in the agriculture sector. Typically, the common practice, whether on a small or large scale, is to ‘burn’ the ‘weeds’ with a herbicide when clearing the land and then plant one crop species, which is given chemical fertilizer to support its growth. This type of agriculture is destructive to the soil food web, the very life of the soil. The greater biodiversity of these types of systems offer resilience to adverse weather patterns and the increased organic matter leads to greater resilience to both drought and flood. The focus on perennial species within these systems results in more stability and protection for the soil. Very importantly, these perennials are also able to sequester carbon dioxide (Co2) directly from the atmosphere and store it in their trunks and limbs, therefore reducing Co2 in the atmosphere. 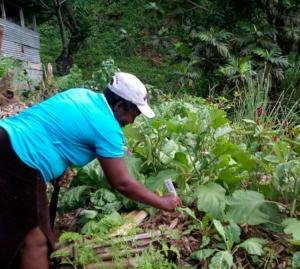 The benefits of this type of farming/gardening system are not limited to the environment. There is mounting evidence that chemical residues in the foods we eat are contributing to the epidemic of non-communicable diseases we are experiencing as a nation and as a global village. The Model Garden project is focused on natural processes as opposed to chemical inputs and therefore offers a path to food sovereignty that is organic and promotes good health. These Model Gardens therefore seek to address some of the most critical issues facing humanity, namely: climate change, environmental destruction and soil degradation, and the non-communicable diseases health epidemic. This is in addition to supplementing the household’s food budget with healthy offerings of diverse organic produce.